This year has been a learning year for me in regards to Guided Inquiry Design. Throughout this year, I have been trying out the beginning phases, Open, Immerse, and Explore. I am certainly not doing them perfectly, but I felt that this year it was important to begin to try. I used to get very stressed out that my primary students were not completing whole projects. In the last year or so (thank you CCSS), I have stepped back and instead, tried to include lots of smaller opportunities for using different parts of the research/inquiry process. I am going to share some of these throughout this post. 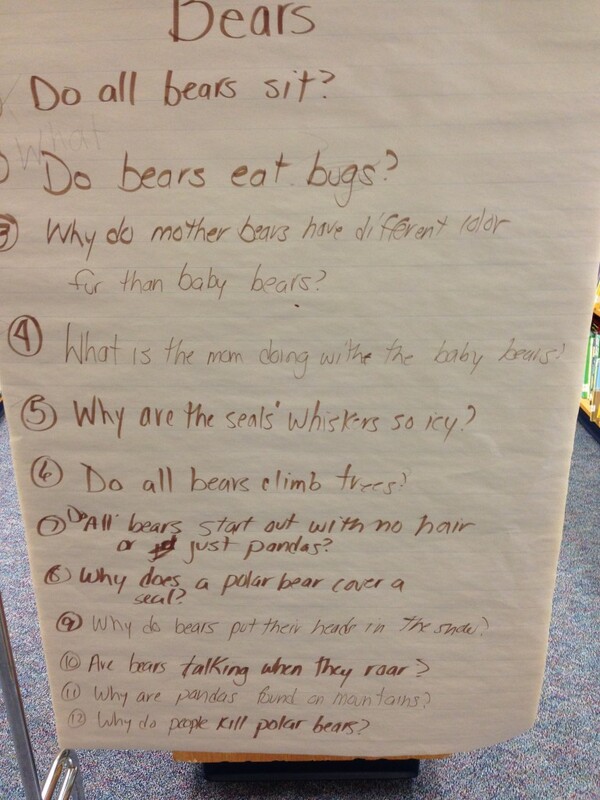 In October, as part of their study of mammals, my first graders and I read a fiction story about a bear and students began to wonder about whether bears would actually do the things written about in the story. I’m not sure if this is OPEN or IMMERSE, but either way, it got us thinking. 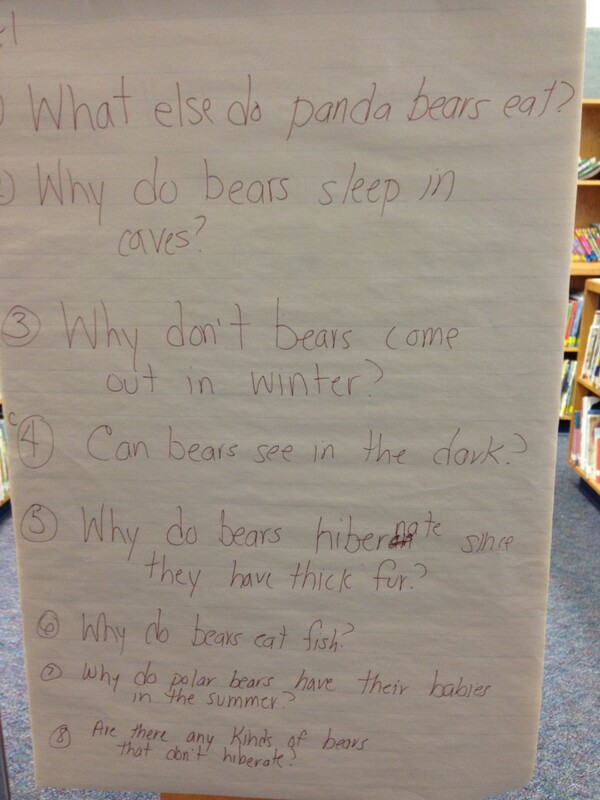 We took time to think about what they already knew about bears. First graders think they know a lot. Bears eat people, hibernate, eat fish, eat berries, have brown fur, that sort of thing. It was amazing that once we got some of the basics out of the way, they were ready to learn more. Next we spent a lot of time looking at lots and lots of print books and digital resources such as PebbleGo and WorldBook Online to learn more (EXPLORE). 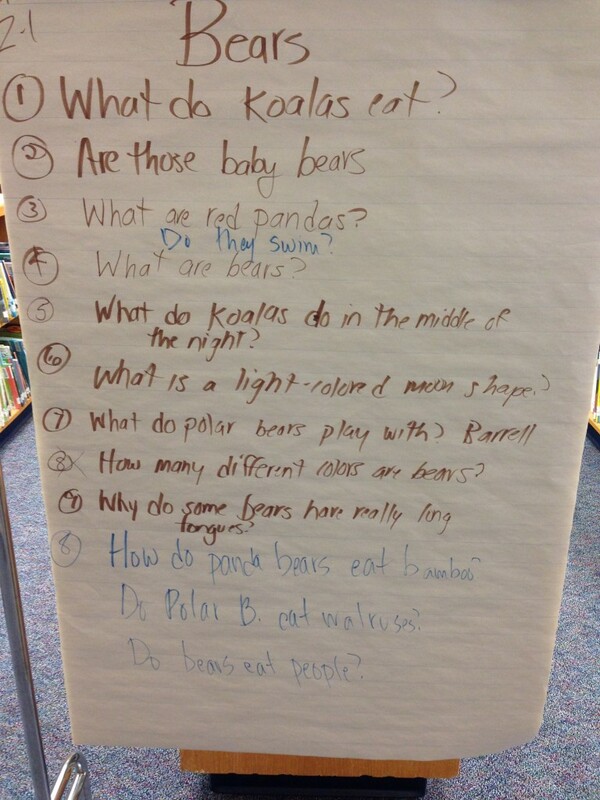 After each library time, we added new questions to a class list. 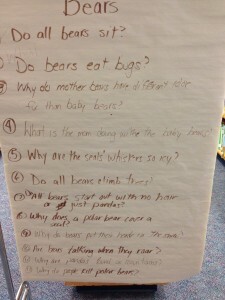 Take a look at some of the types of questions that these 6 year olds had now! 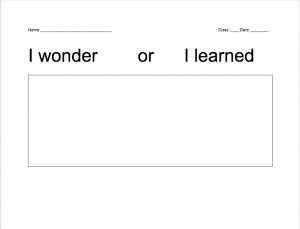 I believe that taking the time to let students do this kind of learning led to much deeper thinking and questioning. 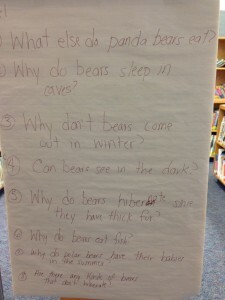 During another 1st grade lesson, I was interested in the students’ ability to generate questions about a topic. I showed a quick Youtube clip of Bugs Bunny and the Tasmanian Devil. This added a little humor to the lesson! I then asked the kids what did they wonder about Tasmanian Devils? I collected their responses via a Google form (I did the typing). Questions had a wide range (What do they eat? and What color are they really? to Do they really look that angry in real life? and Why are they so weird?) I was only using this as a quick assessment, so we did not take it any further, but I can imagine that the questions would get better and more in-depth if we had spent time in the EXPLORE phase. A favorite book I like to read with Kindergarteners around this time of year is Possum and the Peeper by Anne Hunter which is about a spring peeper frog who is making a LOT of noise. They are astounded to find out at the end that it is such a tiny little animal which is making a gigantic noise! This is a perfect way to IMMERSE students as they begin to think about the new season of spring and the changes that happen in the world around them and to the animals living in those habitats. 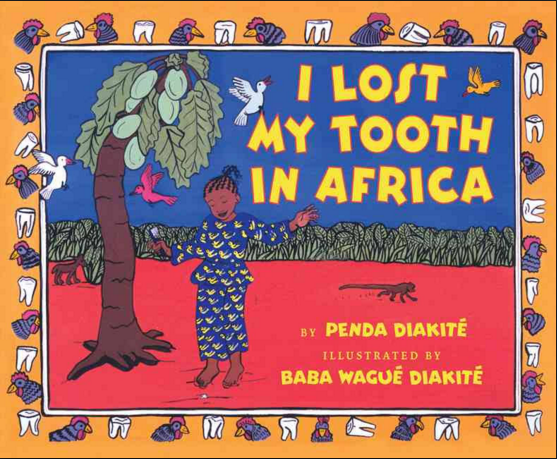 Once we read the book, I begin to use a variety of resources to build more background knowledge. Nationalgeographic.com has a terrific section on spring peepers, complete with the sound it makes! It also has photographs of the peeper next to a paperclip. I feel that connecting these 5 year olds with things they can relate to is so important. A goal I have this year is to try and use inquiry circles by having the students choose an animal from the spring peeper book to find out more about. 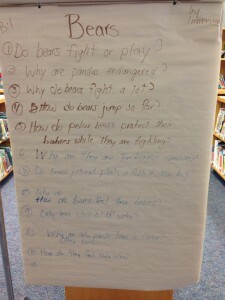 While not a phase of GID, another activity that I have done this year with the Ks is based on an idea from Daniels and Harvey’s Comprehension and Collaboration: Inquiry Circles in Action. Students work in small groups and myself to browse through books or digital media about a topic. 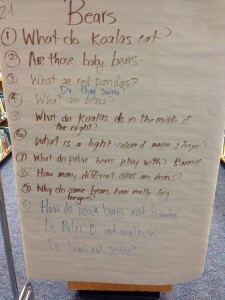 We used the topic of rainforests since they were learning about evergreens in their classrooms and I wanted to connect the different types of trees and animals they might see in each type of forest. As they were reading and looking at pictures, if they found something they were wondering about, they would circle the words “I wonder” on their paper. If they learned something new, they circled “I learned.” Beneath this, they would draw a picture and I scripted their words. I want even my littlest learners to understand that both pictures and words can help you to ask questions and learn new things. At this point in the school year, I often want to do inquiry or research with my students. They have used their library, class and tech time to learn about all kinds of resources, become better readers and thinkers, and good questioners. I also look for opportunities for my students’ learning to be shared not just among themselves or our school community, but to the wider world as well. I am taking advantage of a collaborative effort between librarian Shannon Miller and Cantata Learning called Celebrations Around the World. It is a global project in which students learn about and share in whatever way they choose, about celebrations of their choice. This works well for me since I teach at two schools, whose curricular focuses are slightly different. I also wanted to have students investigating something besides animals or states, but that would still be really interesting to them. 1st grade classes have a One World focus in their classrooms and will be selecting a type of celebration such as Valentine’s Day and investigating how it is celebrated in other parts of the world. The 1st/2nd graders have been studying Brazil with their classroom teachers and we will be exploring similar celebrations in other South American countries. The 3rd/4th grade classes will be researching National Parks which are celebrating their centennial birthday this year. OPEN – All grades began by listening to and singing along with the Happy Birthday interactive book from Cantata Learning. The words were sung in English, Spanish and also shown in sign language. Because it is a song that everyone knows, the kids just joined right in. Including the different languages was a great hook, because it got them thinking about other cultures and celebrations other than just our traditional U.S. holidays. IMMERSE – Each grade level is reading a picture book that starts getting them thinking about their topic. 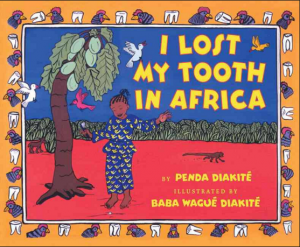 This week the 1st & 2nd graders read the book I Lost My Tooth in Africa, which is a true story about a girl who loses her tooth while visiting family in Mali. Instead of what my students are used to (money), the girl in the story receives CHICKENS! This really intrigues my students and even more so after reading the author’s note explaining how the story came to be. My classes of 3rd/4th graders will be reading The Camping Trip that Changed America by Barbara Rosenstock. This is a fictionalized story of the camping trip that President Roosevelt and John Muir took in Yosemite in 1903, which eventually led to the establishment of our National Park system. I expect to have some terrific conversations about why this happened and it’s impact. 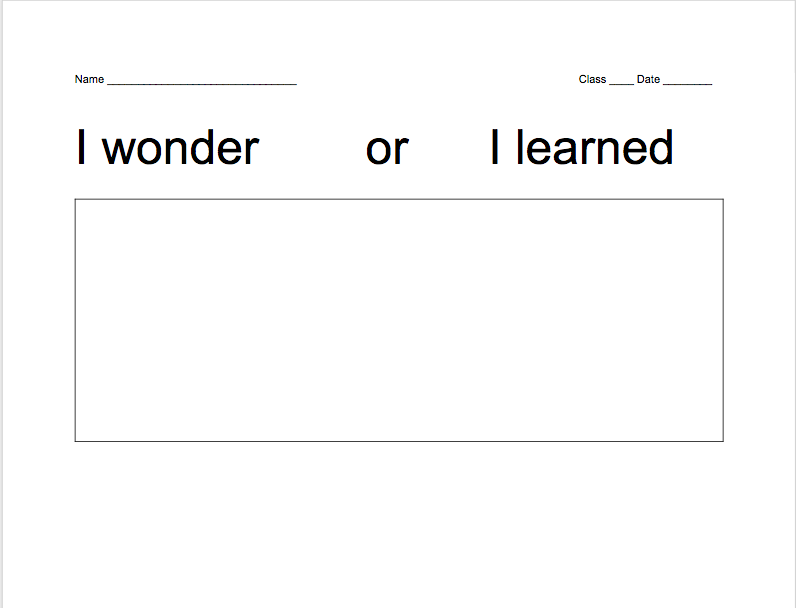 With the 3rd and 4th grade mixed classes, I will be using a form of inquiry journal to begin to have students record thoughts and ideas. EXPLORE – For all groups, the next step will be to browse through many different resources as they begin to develop their inquiry questions. When this inquiry project is finished, we will be adding the student shares to the Celebrations Around the World Google Slides. Not only will we be learning a lot, but we will be able to share with participants from around the world. I am really excited to see where the students go with this! Reading this post over, I can see that I have been learning a lot over the course of this year and still have a lot to learn. It is a process for sure, but it is a great challenge too!